PATRICK Donnelly will be working hard in 2019. 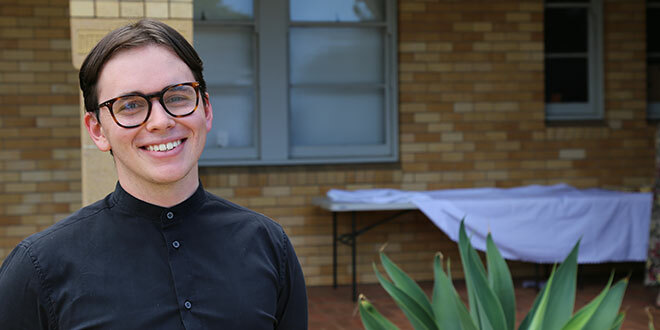 He was one of 7000 students welcomed to the Australian Catholic University McAuley Campus, Banyo, at the 2019 opening Mass on March 4. And while Mr Donnelly would surely be giving his all in academic life, he was also giving his all as part of the campus ministry team. He said this year he would be working to ensure all students felt welcome in campus ministry. Mr Donnelly said he wanted to see students connecting and meeting face-to-face. “The Frontier team will be working hard on that – that’s the student-led ministry,” he said. “They give about 70 hours in total for the academic year, … which is a lot for a university student. Campus Ministry: Patrick Donnelly will be working hard for all students to feel welcome in 2019. Celebrating the opening Mass was chaplain and Franciscan Father Harry Chan – affectionately known by the students and staff as the “Jedi warrior” for wearing his Franciscan habit. During his homily, Fr Chan welcomed students, staff and dignitaries. “Every day we learn new things, we meet people face-to-face, and we learn from each other,” he said. “What would be your ultimate question? In many ways, university was about discovering the ultimate question – and sometimes finding the answer. For some, these ultimate questions were found in world-class research and, for others, it was about making a local impact. Campus Identity and Mission associate director Mark Lysaght said 2019 would be a year of grassroots engagement. He said students were engaging in these projects as part of their courses. One such project was volunteering at Blind Eye Ministries in South Brisbane. Mr Lysaght said people would be surprised at times about the work that students did to help people in Myanmar and East Timor. “The ACU Engagement is really a fantastic part of the university,” he said. Associate Vice-Chancellor Professor Jim Nyland said there were “huge plans” for 2019. He said the university had spent $150 million on the campus over the past seven years and hit the top rankings in world-class research in many fields. “As a university campus, we’re in a perfect position,” Prof Nyland said. He said his priority this year would be student experience – led by the student association. 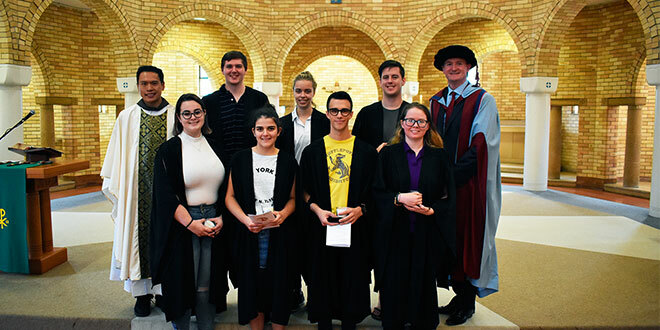 Towards the end of the Mass, Prof Nyland commissioned the campus student association. Fr Chan and those gathered in the chapel blessed the students for the year to come.